I wanted to move forward, so I decided to step backwards. Coming to that realization and taking that crucial first step was a daunting endeavor. Five years ago I was a Director for a nonprofit I loved. I was also a lead sewing instructor at a trendy shop. I trained and completed triathlons. I was dating my (now) husband. I had it all “together”. When my daughter was born, I was no longer the Director for that nonprofit. The sewing shop closed, and triathlon training took a chunk of time that I no longer had. After spending the first five months home with my daughter, I decided to re-enter the work force. We were going through tough times in our economy and firms were not hiring. After a year-long stint at a company where the CEO decided to sell its assets to a firm in Tennessee, I was facing unemployment. It was in those moments I realized I needed to make a plan. Even if I had no idea where to start, I knew that I no longer wanted to be the subject of budget cuts or small business decisions. I wanted to work in the energy industry. I wanted to work for a reputable company. I wanted more, and I took what seemed like less. Although I had the capacity to take on another high demand role, I wanted to step into a reputable company that would lead to a mutually beneficial relationship. As time passed, I was ready to make my next move. After a lengthy period of searching, an internal position opened. I applied. I was called to interview. I was honest. It paid off. I wasn’t offered the job. Rather, I was referred by the SVP that interviewed me to another SVP. My honesty and conversation gave me an opportunity to apply for a higher position, and I nailed it. Looking back, here a few key takeaways. Fear exists when you let it. My own self-defeating messages were not helpful. Being type-cast into the role I had, was easy when I was doing it daily and that’s what people saw, but I knew that I had education and experience behind me that would fuel my next step. I had a plan…and I had to keep reminding myself of this. 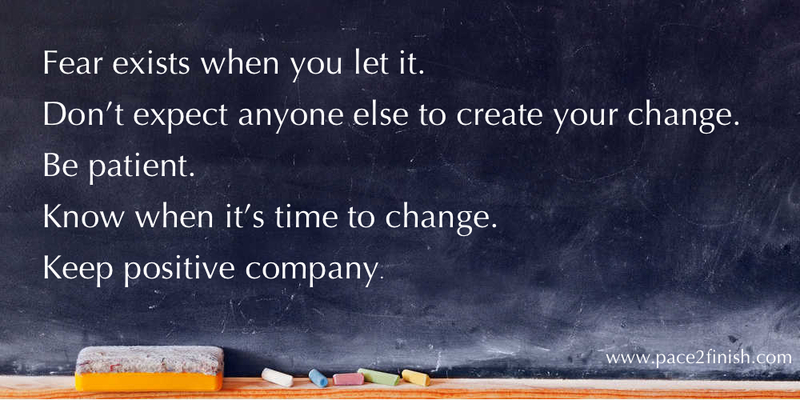 Don’t expect anyone else to create your change. No one will take a greater interest in your well-being than yourself. Networking and staffing companies should be an arm extension of the work that you are already doing. They may knock on doors for you; however, ultimately, it is you that sells yourself. Be patient. I am a fan of Katie’s “Pace to Finish” motto. After all, when we met, I was the slow poke in our running drills. She stopped, turned around, ran beside and helped cheer me on at my pace, and we finished together. Everything works at its own pace. Other people will be promoted before you; they will change jobs and get those raises. Use those moments as reminders that it can and will happen for you, too. Keep at it, and you never know when that door will open for you. Know when it’s time to change. Stop ignoring those obvious red flags. Weigh those pros and cons. Be courageous. Courage comes in various forms. Any movement towards making a change is courageous; even if it is backwards. Keep positive company. My husband has been my number one supporter. My friends are always honest. These people are reflections of me. I’ve had to shed off a few toxic pounds and it’s only helped me gain sense of my stronger self and to see myself for whom I am and want to be. Two years ago, I took a detour and I am so happy that I did. Editor’s Note: Abby is a total champ. She slowed down to speed up. She played her career like chess and made great moves. She showed curiosity, courage and shed dead weight to focus herself. Way to play the game, my friend. Great story! I truly believe looking backward, briefly is a necessity if your plan is to be greater and do greater things in your life!